We are still accepting new students! Email Reese.ArtKlub@gmail.com to sign up for spring classes. Field trip to Preservation Hall will be on either April 8th or May 13th (TBA)! We are super excited to be partnering with Art Klub and the Preservation Hall Foundation to bring you this weekly music curriculum! 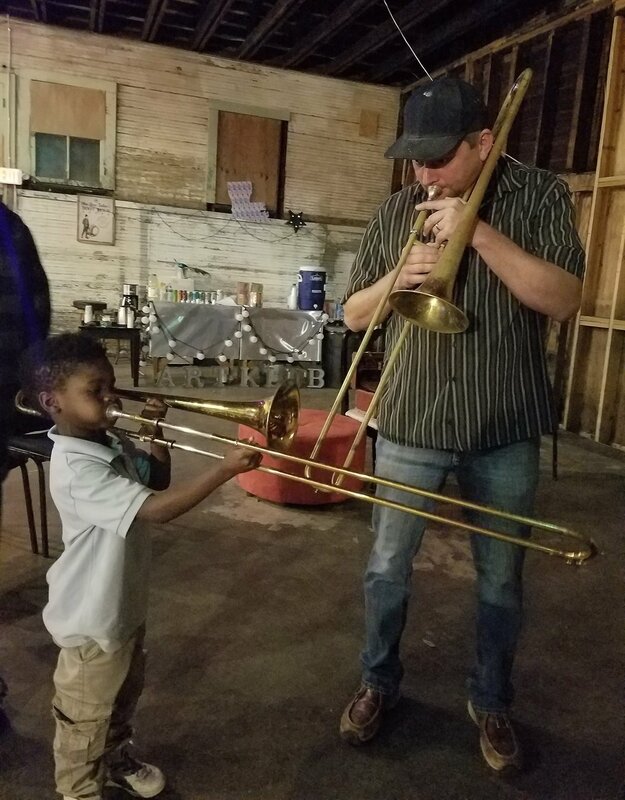 Kids Brass Jam is a weekly recurring educational program that teaches, mentors and inspires students through music instruction on trombone, trumpet, sousaphone and drums, as well as music theory and learning how to read music. Announcing Art Klub’s New Music Director: Clifford McPeek! Clifford has over 30 years as a professional musician and music teacher. He plays and teaches all brass instruments as well as guitar, bass and beats. We’re adding to our Kids Brass Jam curriculum! Your kids will learn to read music! New, fun ways to explore music and music theory! But he can't do it all, so percussion teacher Patrick Driscoll keeps the rhythm rolling. This is Patrick's 3rd year with Art Klub and the kids love him! So, if its drums your child wants, Patrick has that covered. We are able to offer this unique music curriculum due to generous support from Threadhead Cultural Foundation, Preservation Hall Foundation, the New Orleans Jazz and Heritage Festival, the New Orleans Jazz Museum, Red Dress Run Hash House Harriers and Griffin Family Foundation! Students will have an opportunity to explore all of the instruments, however please let us know which instrument your student is most interested in playing. Some instruments will be provided on site, but it is best if your budding musician has their own. Please let us know if you need information on purchasing or renting an instrument while at the Art Klub, or if your child already has their own. We strive to instill a love for playing and listening to music with community centered programming. 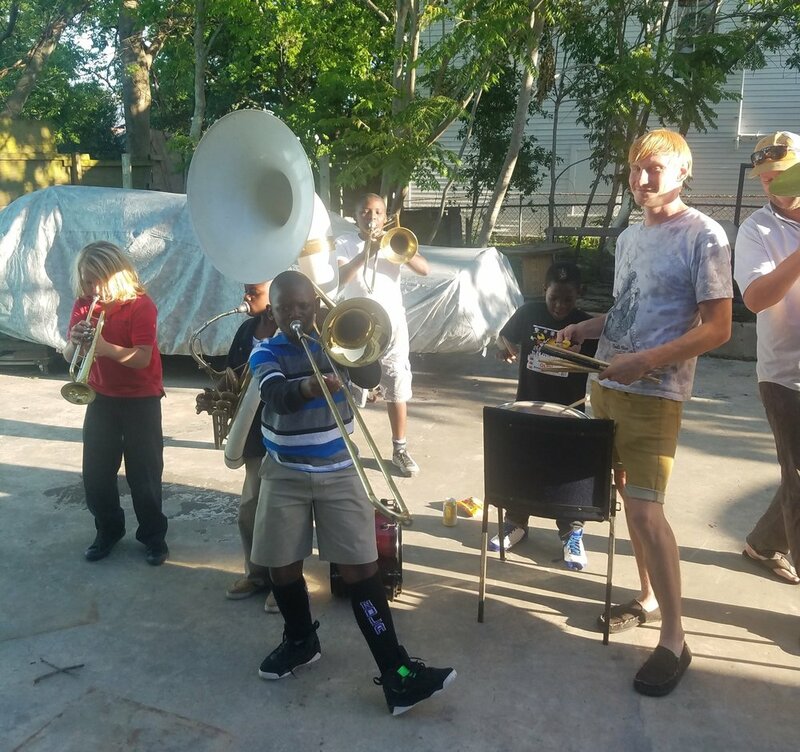 After the Spring Session, the Art Klub Kids Brass Band will perform a concert at the New Orleans Jazz Museum on Thursday May 23 at 6pm. This concert features our kids and the teaching artists playing with the Preservation Hall All Stars! Witness the magic of New Orleans brass band traditions and Louisiana music and cultural heritage played by the promising talent of the St. Roch neighborhood and surrounding 504 area youth musicians. Let’s celebrate big brass music and New Orleans rising talent. Registration now open! Email Reese.ArtKlub@gmail.com to sign up for fall classes.